Spring is a lovely time of year. The days are brighter and the kids can get outdoors again after being cooped up for the Winter. 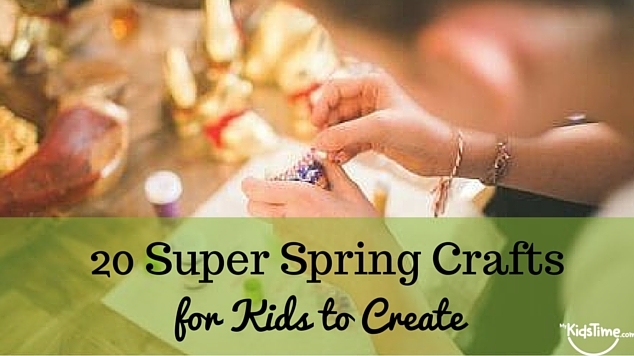 Why not celebrate the arrival of Spring with our 20 Super Spring Crafts for Kids to Create? Sometimes the simplest crafts are also the most fun. 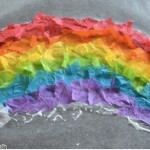 Using just tissue paper, craft glue and waxed paper you can create a beautiful rainbow window decoration. Or use the concept to create different designs. I love this one on the image from Momontimeout. Sail the seven seas, or in a puddle or stream in this handmade boat. 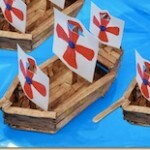 This design was on Craft Project Ideas to celebrate Columbus Day. There are 23 steps, so younger children may require a little help. But don’t they look great and worth the effort? 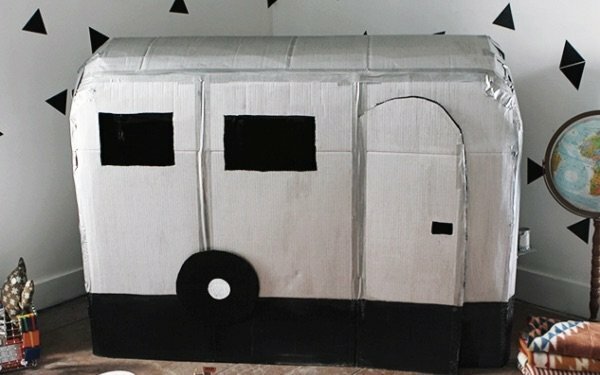 As it is still a while off to the summer holidays, why not create your very own mini break at home with this fabulous Cardboard Caravan from The Merry Thought? Go off on adventures with your friends and as the weather improves, your caravan may even be able to go outside! Image from The Merry Thought. 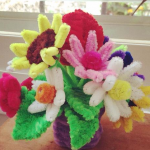 As the flowers start to come out of hibernation why not make your own colourful array of flowers? 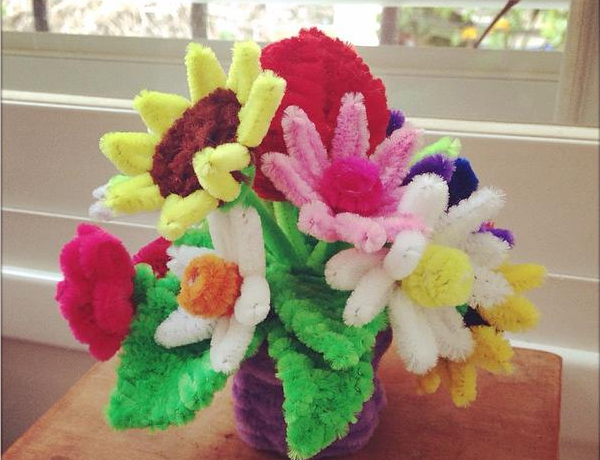 All you need is a collection of colourful pipe cleaners and some creativity. Create your very own indoor garden to enjoy by planting grass seed in sawdust and encasing it in nylon, water it and watch it sprout! Simply add your grass seed to the toe part of your old tights and top up with a few handfuls of sawdust or sand. Secure the top by tying it tightly and place your ‘head’ seed side up, in your pot. Water it every few days and wait for the grass to grow. 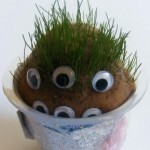 Once you have created your grass head, why not decorate him with googly eyes, felt or ribbons? I love this Grass Head Monster from Activity Village. After winter winds and storms the beaches are usually littered with driftwood. See if you can find any smooth driftwood along the beach and take it home to create a piece of art. 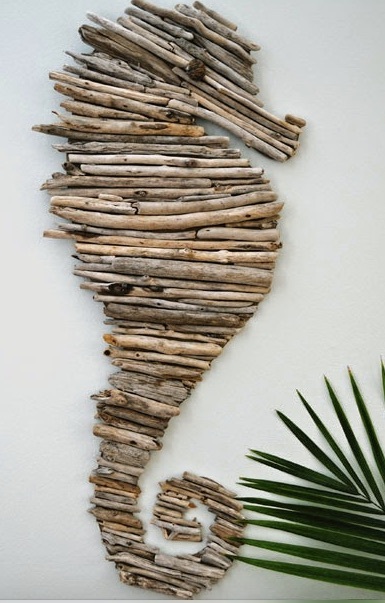 I love this driftwood seahorse craft which I found over on Creativeinchiago showing us that even small pieces of driftwood can be turned into something beautiful. Save the inner tubes from kitchen and toilet roll as they can be turned into treasures to keep forever. 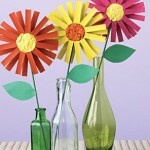 Aren’t these paper flowers so cute? 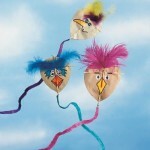 They are easy to make and can be painted in all different shades to create a fun Spring garden. All the instructions are over on Better Homes and Gardens. Let the kids’ imagination soar with this paper craft by How Stuff Works which will show you how to make a whole flock of bird kites. They can be decorated however you wish. Best of all, when they are done let the kids trial them outside! 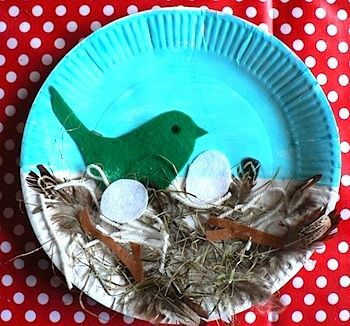 This craft activity is probably best suited to slightly older kids, or for younger ones, get Mum or Dad to help. Now that Spring has arrived and you can get outdoors and collect twigs, feathers, leaves and other small objects, why not turn them into a nature collage? 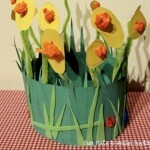 Nature collages are great Spring Crafts for Kids. 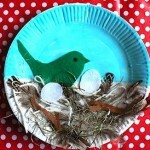 The objects can be glued to a paper plate that you have already painted. And you could add a background scene, like a bird or some fish before you get going. Get ready for the sun by customising a plain coloured t-shirt using fabric paint. 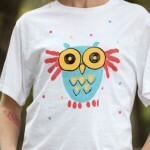 I love this Owl design which I found, along with instructions and a template, over on I Love to Create. Smaller children may need a bit of help with this activity, but once they get started you may be running to the shops to buy more tops to customise! This craft could also be repeated to create a cute canvas tote bag. Using a star shaped cookie cutter, yellow card and some tissue paper, you can create beautiful Paper Daffodils. 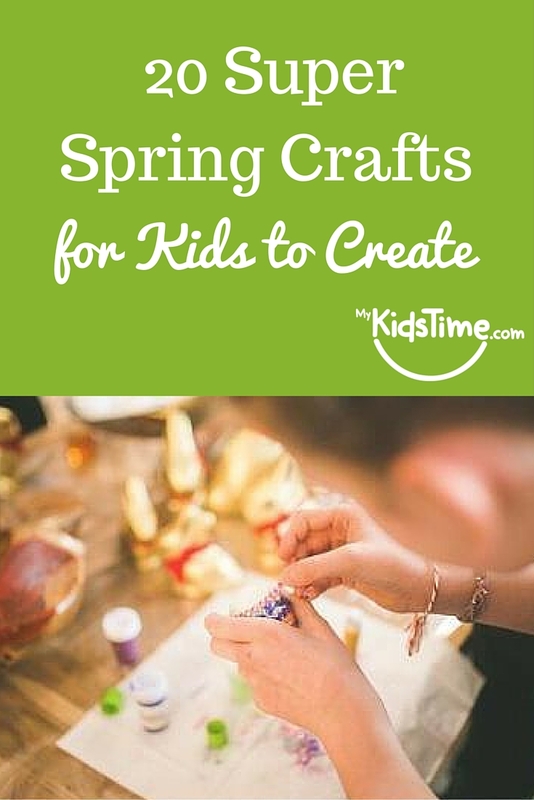 These can be added to string to create Spring bunting, or glued to a larger piece of cardboard to create a 3D picture or even added to a popsicle stick and placed in a vase. Once the dough is made, your child can mold it to whatever shape they wish and press their finger print onto it before baking. 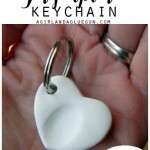 You could make a keyring or a pendant. Mix until it has the consistency of play dough. Bake at 250F/120C for 2 hours, then cool and you could also paint the love heart before attaching ring or cord for the pendant. 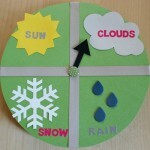 Creating weather clocks is a great spring craft for kids as we get April showers, spring sunshine, clouds and sometimes even snow. We loved this example of a fun Weather Clock on Warmhotchocolate.com. You can use a paper plate for the circle and then cut out and glue on your weather icons and make a pointer arrow pinned to the middle with a paper fastener. Kids would enjoy changing the pointer every day to that day’s weather too. 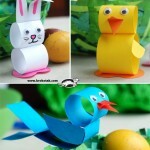 These cute Easter animals are made of coloured paper. The Krokotak website is in Bulgarian but most browsers can translate and there are easy to follow photos with printables. All you need is a selection of coloured card, glue, scissors and some stick on eyes to create your very own selection of Easter animals. These origami tulips are sure to blend in well with the real thing. You can be as creative as you wish with the colours. 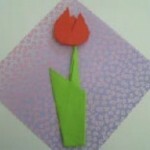 Get full instructions on how to create your very own bunch of tulips over on Activity Village. 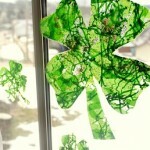 As St Patrick’s Day falls during Spring (on March 17th) we have created a post with fun St Patrick’s Day Crafts for you to make.They include this fun shamrock sun catcher from the Hands on: as we grow blog. They used “transparent contact paper”, but you could also use the self-adhesive, clear book covering which is available in school book shops/online shops. You’ll also need green tissue paper, green confetti and glitter. 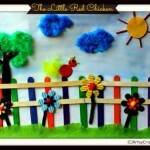 Using paper strips to create a picture is a great craft for kids. Pick different colours and designs and build them up to create your picture. 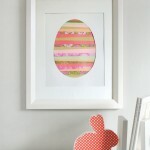 I love this paper strip Easter egg from Minted. They have created an egg shape cutout to use as a template and framed the image when it was finished. You could use the same concept to create a beautiful butterfly or Spring flowers. We love this Spring hat from Sun Hats & Wellie Boots. With the cute little daffodils and ladybird – your kids will feel very proud wearing their very own Spring creation. The simple design is suited to younger children also, with just a little bit of help from you! Using cotton wool, straws, popsicle sticks, paint and glue, you can create a colourful Spring picture that could be framed and hung on the wall. You could add some Spring lambs using white cotton wool with black paint dots for eyes. 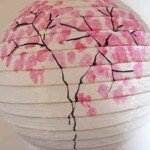 Update your room for Spring by painting your very own Cherry Blossom Pattern onto a paper lantern. You could use a single round lantern or if you want to have a string of lights find white cylinder lanterns and decorate each one with a unique painting. 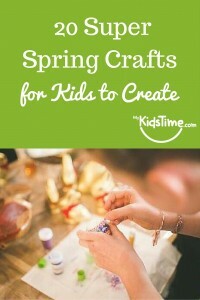 Have you tried any of our Spring Crafts for Kids or do you have any ideas of your own? Please share them with us in the comments box below.